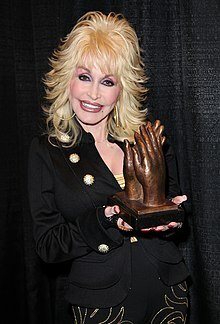 Dolly Rebecca Parton (born Januar 19, 1946) is an American sangster-sangwriter, actress, author, businesswoman, an humanitarian, kent primarily for her wirk in country muisic. ↑ "Dolly Rebecca Parton - The Beginning". Dolly Parton Productions. Retrieved June 14, 2015. This page wis last eeditit on 10 Apryle 2017, at 02:21.